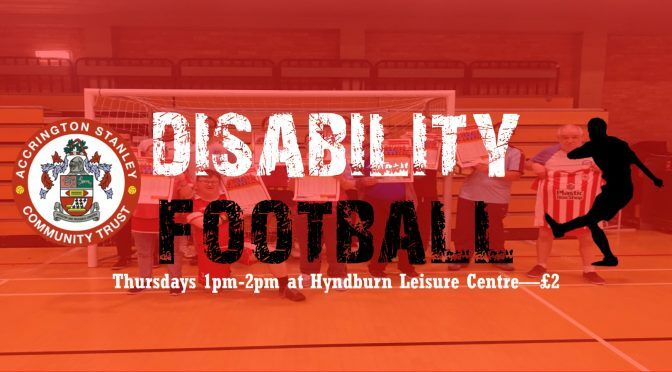 Accrington Stanley Community Trust launched an adult disability football session back in 2010 which continues to be a success. The Disability Football sessions consist of fun football activities, games and football coaching drills. Sessions are open to all abilities and impairments so make sure that you make it down to join in the fun! This specifically designed project works with individuals with a range of physical and learning disabilities. We have an excellent reputation for caring and inspiring disabled people. All of our disability football sessions are led by staff that are experienced and confident in working with people with all types of disabilities. The sessions have enabled many people to take part in activities which will improve their confidence and self-esteem. Sessions are charged at £2 and there is no need to pre book, simply turn up and enjoy an hour of fun.